The principal of Admiral's Academy in Conception Bay South will face criminal charges of assault, in connection with four students at the K-7 school school. The principal of Admiral's Academy in Conception Bay South will be charged in connection with alleged assaults on students, according to emails obtained by CBC News and sources involved in the investigation. Robin McGrath was arrested last month, though charges have yet to be filed at provincial court in St. John's. "District has been advised that the Royal Newfoundland Constabulary has arrested and charged the school principal with four charges of assault and one charge of uttering threats, all of which are against students at the school," reads an internal email sent by the Newfoundland and Labrador English School District. In the same email, the school board also warned its members to expect media attention. "It is anticipated when this individual appears on the court docket, or prior to that, there will be significant media interest in the story." CBC News has been unable to reach McGrath by phone or email, but sent a message for him to the teachers' union on Tuesday. In 2013, McGrath was named one of Canada's top principals by a national organization, the Learning Partnership, and was congratulated by the provincial education minister. He was placed on paid leave by the school district after a complaint was made, and an investigation was launched at the end of the last school year. Nancy Healey took over as acting principal, and McGrath was placed on unpaid leave last month. CBC News did reach a parent of one of the children allegedly assaulted by McGrath, who said they first learned of the arrest from the Royal Newfoundland Constabulary last Thursday. The child was five years old at the time of the alleged incidents. The parent said they don't know the specifics of the allegations, but were told it involved emotional and physical elements, short of punching or hitting. "As far as I know, he never hit my child," they said. According to the parent — whose name is withheld to protect the identity of the child — McGrath is set to appear in provincial court March 26. When contacted by CBC News, a spokesperson for the Royal Newfoundland Constabulary said no statement could be made until charges were filed and sworn with the court. A person is not formally charged until those charges are sworn in court. It's common for this to happen on the day of a first court appearance. While specifics are unclear, the Newfoundland and Labrador Teachers' Association alluded to a lack of resources as a factor in the situation. The association sent an internal memo, asking teachers to take a stand against McGrath's unpaid suspension by signing their names to a form letter and sending it to the school district. 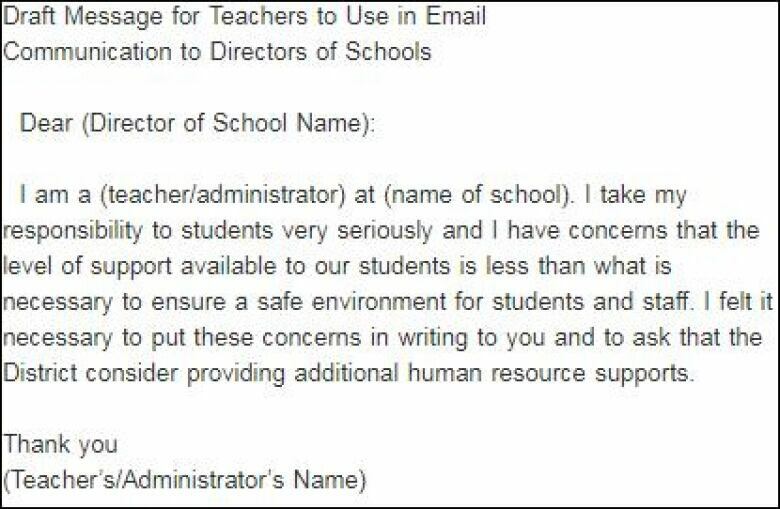 "I take my responsibility to students very seriously and I have concerns that the level of support available to our students is less than what is necessary to ensure a safe environment for students and staff," the letter reads. 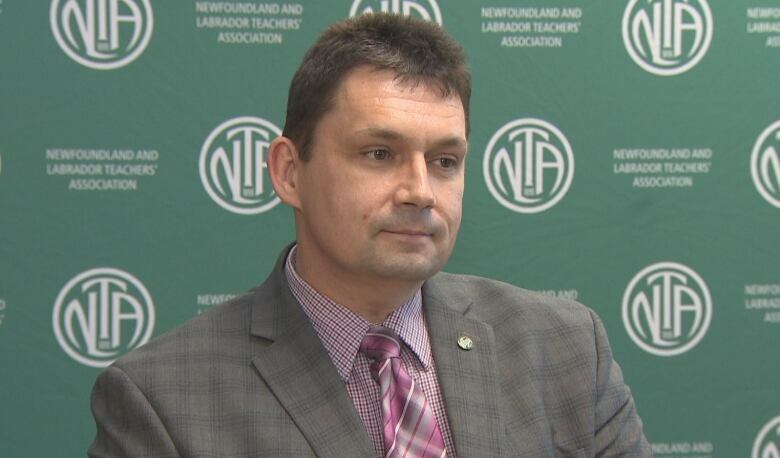 NLTA president Dean Ingram spoke to CBC News on Tuesday, and confirmed the union is backing McGrath against the school district. While he wouldn't comment on details of the case, he did elaborate on what was meant by the form letter. "Teachers who interact with students have to have the resources to allow them to effectively and appropriately interact with students," he said. "When there's a lack of resources provided for teachers to do exactly that, it makes it very difficult and they sometimes find themselves in very compromising situations." When asked how that applies to this case, Ingram said he couldn't get into specifics, but wants to assure everyone is safe when teachers have to make "certain interventions." Ingram says the unpaid suspension is jumping the gun and ignoring McGrath's right to be presumed innocent unless proven guilty. "We take issue with the fact that they disciplined without the criminal process being carried through to fruition," he said. "That's really at the heart of where our concerns are with this matter." When asked if he thought having McGrath in the school would have been a distraction, Ingram said other measures, like a paid suspension, could have been taken. "The district has made a decision. The district has levied discipline without having completed an investigation and without the criminal process being carried through to fruition." District chairman Goronwy Price would not respond to the incident, but did offer a response to Ingram's comments. "The board does not, and would not, take any action against a teacher without the proper authority," he said, citing a clause in provincial legislation that allows unpaid suspensions for employees facing criminal charges if it's determined they'd be unsuitable to return to work. "The district appreciates and supports its employees who carry out their duties, in accordance with their professional training, and to the best of their ability, while ensuring the safety of students and staff," he said.